Some 1,000 Americans finally left Beirut on the government-chartered cruise ship Orient Queen. The trip to Cyprus is estimated at about 10 hours, reports CBS News' Kristin Gillespie. 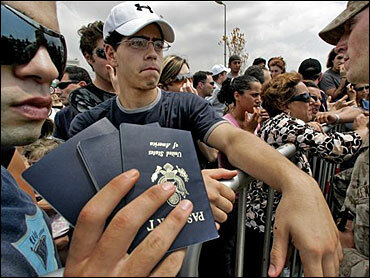 Once there, the U.S. citizens will make arrangements to continue on to other destinations, including the United States. The State Department dropped plans to make the Orient Queen passengers pay for their passage. Thousands more Americans still want to leave Beirut. "Today in the port there are six chartered ships that are taking an estimated 30,000 Canadians out of the country, all in one go," reports Gillespie (audio). "The British and the Europeans are also continuing to evacuate their citizens. They began these efforts last week." Meanwhile, Israeli troops clashed with Hezbollah guerrillas on the Lebanese side of the border Wednesday, while Israeli bombers flattened 20 buildings and killed at least 19 people, as fighting between the two sides entered its second week. Lebanon's prime minister said Wednesday that 300 people have been killed, 1,000 wounded and half a million displaced in Israel's week-old onslaught on Lebanon and said he would seek compensation from Israel for the "unimaginable losses" to the nation's infrastructure. Israeli sources tell CBS News that U.S. Secretary of State Condoleezza Rice will make a one-day visit to Israel on Monday, then go to Asia and come back to Israel on her way back one week later. Two Arab boys, ages 3 and 9, were killed in a direct hit by a Hezbollah rocket on the mainly Arab town of Nazareth in northern Israel, revered as the hometown of Jesus. Americans wiped away tears, hugged relatives and grumbled about evacuation delays Wednesday before boarding the luxury ship that is carrying them from war-torn Lebanon. A U.S. Marine general coordinating the evacuation from Lebanon estimated Wednesday that more than 6,000 Americans will be taken out of that country by the weekend. Brig. Gen. Carl Jensen also stressed that the U.S. Embassy in Beirut will not close and that America "is not deserting Lebanon." Gillespie (audio) reports it was a much different scene at Beirut's port Wednesday: "It almost looks like an airport terminal, with a check-in area. There's a huge makeshift tent where people line up. They've got their small, little suitcases with them," Gillespie said. "I can't believe the Americans," Danni Atiyeh, a 39-year-old civil engineer from Kansas City, Mo., said as he waited with his pregnant wife and sons Ali, 10, and Adrian, 6, for buses that were taking them to the ship. "Everybody else has gone home ... We're still here." An estimated 8,000 of the 25,000 Americans in Lebanon want to leave the country, and the Orient Queen only holds 1,000.
. "There are shells landing all around us. We can hear the constant boom of outgoing artillery. Israeli tanks on the road and on the border are engaged in this firefight. There are reports already of two Israeli soldiers killed," Logan said.